As a missionary team, we need a strategy which we all can agree in order to work together well. Our team strategy has been developed over the past few years through discussions with our supporting churches and with the experience gained here at Mumena. In a normal schedule, we have weekly team meetings to train and improve ourselves as a team. The knowledge gained from these meetings slowly molds our strategy. Ideally, this will make us more effective as we partner with God. Brian Davis, who has been the organizer and academic mind for the team has created a presentation which can communicate the team strategy. He has also written many posts on the team strategy which you can read here (look near the bottom). In the next few weeks, I (Rick) will try to point out some important concepts from the Team Strategy. Since I have just arrived a few months ago, I am also in the process of learning the team strategy. I will try to share what I learn with you who are interested in understanding our strategy. 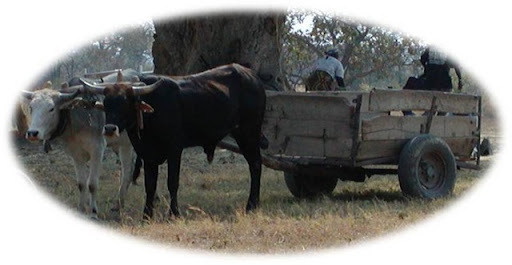 Don’t get the cart before the horse... or oxen. Productive Christian development must follow the transformation of the heart that comes by church planting. Another words, church planting must come before development. If a person's heart has not turned to God, they lack the foundation to build a better life. Most of their problems are caused by sin or irresponsibility. God is the only one who can solve this and give them the strength to change. A meth addict is trapped by his addiction. This is one form of sin. If you give him a dollar, he will use it to buy drugs. If you try to teach him a skill, he will never use it because he will be wasted most of the time. If you teach him personal hygiene, his teeth will still rot out because of the meth. The problem is sin, and the person needs help from God to overcome his addiction. Until, he starts to overcome his addiction, you will not be able to help him. After he begins to transform his heart to God, then you will make progress. He will trust God to give him strength whenever he is pulled by the addiction. You can begin to teach him positive values for his life. He can develop a purpose for his life. He can learn new skills which will improve his life. He can even use his new skills to help others. He will transform into a person who serves God in everything. None of this will happen until he transforms his heart towards God. Many men waste whatever money they make buying beer. They may have a good job, but their families are hungry because instead of buying food they get drunk. We cannot help them until they turn to God and begin to transform. Many people who were drunks have become Christians and are now doing well. Their families are happy, they are better workers, and they are capable of helping others. Now they are able and open to improving their lives. Among the Kaonde greed will destroy families. This happens when a man moves to the city to get a better job and leaves his family behind. There in the city, he starts to make more money. He may begin by sending the money back to his family. However, he soon begins to follow other desires. He is away from his family and support. He may begin drinking to overcome his loneliness. He may get a mistress or hire a prostitute to satisfy his sexual desires. His life will begin spiraling out of control as his family falls apart and suffers at home. When a person dedicates themselves to God, they also learn the value of family. Instead of following greed, they begin to plan and think what is best for their family. They see what has happened to families when the man has moved to the city for work. Instead, they can decide that it is more important to stay close to their families than to make more money. Also, he begins to find appropriate ways to improve his family's well being. He will provide better food and shelter for his family, support his children's education, and listen to other ways to improve their life. Sleeping around is very dangerous for our bodies, minds, emotions, and souls. However, it is common among the Kaonde. AIDS has wiped out almost an entire generation. The problem is more widespread in the cities, but men who visit the cities can bring AIDS home to their wives. Also, when the man is gone, the family is falling apart, and the wife and children are starving at home, she will exchange favors (prostitute herself) to a man who might take care of her for a short while. God teaches us to love him with our bodies as well as our hearts. When a person dedicates their bodies to God and remains pure, they will avoid the pains of sexual sin. Husband and wife can dedicate themselves to each other and lead an example for their children. Young people can remain pure and find a spouse who will do the same. Marriages will be strong and the husband and wife will love each other. In this situation, the family will care for itself and the community and help bring change to others through example. They will listen to development efforts and understand how they can improve their lives. Sin is not the only cause for poverty, but it is one of the major causes. When a person turns from sin and dedicates themselves to God, they now have a strong foundation for improving their lives in every way. This is how transformation begins with the heart, and then leads to transformation of the whole person.